Thread: Not sure what I did wrong. 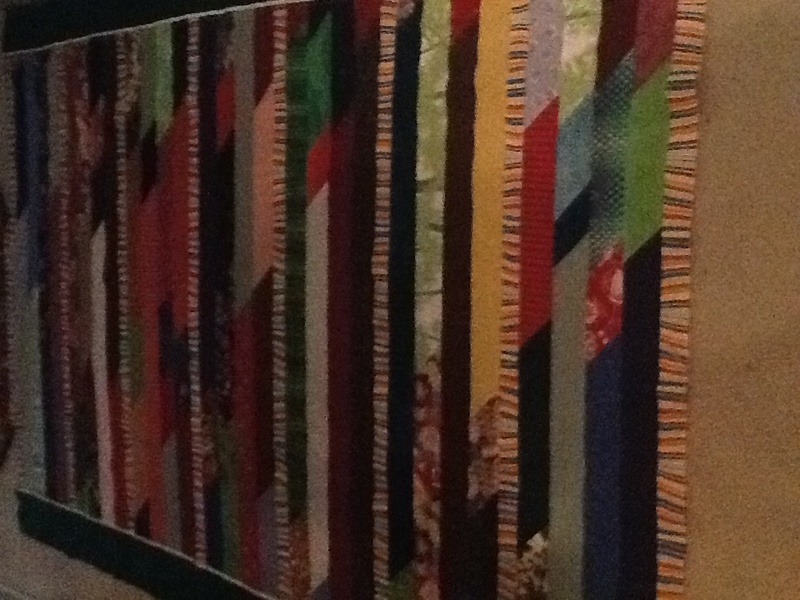 This is my first Jelly Roll Race quilt. I wanted to make it crib size, I think I did the math wrong or sewed it incorrectly. I watched the Missouri Star Quilt tutorial on youtube. Mine never did look like the one she was sewing while I sewed it, I didn't ever have straight ends I always had to cut it to make it straight on the bottom before I could put them together to sew another row. It measures 33 inches wide by 59 inches long. I wanted it to be about 52 inches long. Any tips on what I might have done wrong will be greatly appreciated. Oh and I cut 27 2.5 inch strips to do it. Did you sew all your strips end to end first, then discard the first 18" ? This isn't one of my favorite patterns, but when Jenny did it she didn't cut the ends as she sewed, she just cut the first one in half the started sewing end to end. When finished with that step she takes one end and lines it up with the other end and starts sewing, when you get to the fold, cut it, etc. etc. etc. I have seen where others have then taken the quilt and cut it up to make a totally different design. Yours isn't bad, if you like it - finish it. Well if it's 7 inches longer than you wanted just trim off 7 inches. I think it looks great. If you do cut the 7" off, trim the cut off portion off and use it in the backing. That would look cute, too! Since you cut the strips yourself, could it be that when you sewed the strips end to end you didn't alternate fabric choices enough? I have never done one that did come from an already precut jelly roll and in them you just take the strips as they come so I never thought about what color followed what color. Its still beautiful. Besides erstan947 suggestions you could also cut into blocks for a Rail Fence Quilt. See http://prayerquilt.org/infopages/RailFence.pdf. Either way the colors are great for a baby. Good Job! By the way, if you do decide to cut it make sure you add 1/2 inch after you decide how large you want the squares to be to account for the seaming. I love some of these options to break it up. Thank you all so much for the tips and suggestions it is really going to help me to finish it. I will post a pic when it is complete. It looks good, even if it wasn't quite what you wanted it is still a nice one. By all means finish it. You could add an applique somewhere to make even more different. I don't see a thing wrong. Finish it. You'll be surprised how good it looks. Put a pretty border on it and it'll be a good one. I was going to suggest what Barny did - add a border. If you'd like it to be more square, just cut it to the length you want and then add borders all around. You can then unsew the strips you've cut off, sew them end to end and use them as binding which will bring the whole thing together. Rick, I think it looks great! One thing that might have changed things is that most jelly rolls are about 40 strips. I just quilted one and the sides were not straight. I quilted it and then trimmed it up. You could add a border if you wanted to make it wider. If you need to trim off some of the length 1st, I would use that in a pieced back. I lived in Plattsburgh twice! My dad was stationed at the AFB the 1st time and the 2nd time we moved back there when my dad went to Vietnam. I went to Oak St Elementary and Plattsburgh JR high. My uncle moved there after the base was closed and lived in some of the base housing that had been renovated for seniors. I used to go to summer camp on Silver Lake. We could see Whiteface from the end of the lake. Miss the Adirondacks...lived in the desert for 20+ years! be sure to post a picture when you are finished! The result depends on the length of the strips as well as how many you use. I think it's pretty, but it might be a little long and narrow for a crib. Babies don't sleep with blankets or quilts and such these days because of concerns about SIDS, so it will be used for "tummy time" on the floor, and maybe in the car or stroller. If you want to adjust the dimensions, you could use a seam ripper to take off several rows and maybe add a border. In fact, if you split it down the middle and added, say, 8" borders, you could have two nice little baby quilts. If you don't want the double rows, you could unstitch between them and turn one end 180 degrees. Whatever you decide, it will be fine, and someone will be thrilled to get it. I like it the way it is!! !